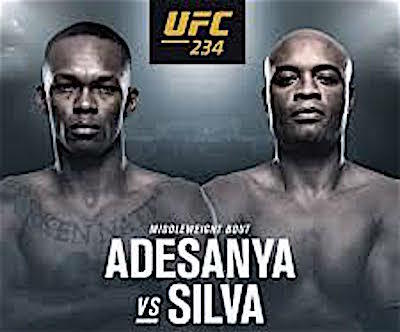 Middleweight legend Anderson Silva will seek to prove he’s still got what it takes to take on today’s young guns when he faces the phenomenal Israel Adesanya in tonight’s UFC 234 main event in Melbourne. The PPV undercard features Lando Vannata vs. Marcos Rosa Mariano, Rani Yahya vs. Ricky Simon, Montana De La Rosa vs. Nadia Kassem, and Jim Crute vs. Sam Alvey. The UFC 234 pay-per-view main card kicks off at 10 p.m. ET/7 p.m. PT and you can watch the live stream online for $64.99 in the player below.